Drawing from the spirit of the menus at Morton's original Chicago location and their eighty other restaurants around the country and the world, Morton's the Cookbook includes familiar and delicious American steakhouse fare accentuated by the flavors picked up as the restaurant has grown to span the globe. 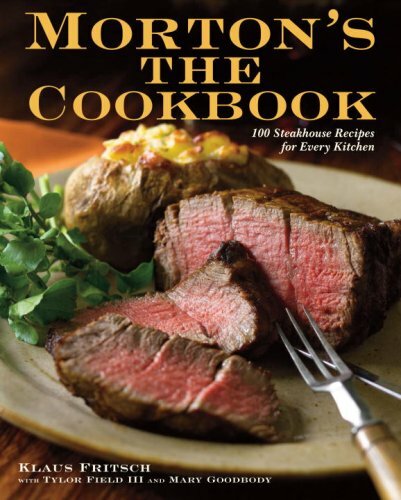 The expert on steak, Morton's shares its wealth of information on how to cook your steak to perfection in enticing recipes such as New York Strip Roast with Three Peppercorn Sauce and Bone-in Ribeye with Rancher's Rub. Complete your meal at home with recipes for delicious appetizers and classic steakhouse sides, such as Five-Onion Soup, Maine Lobster and Avocado Salad, and Blue-Cheese French Fries. Tempting desserts round out this bold collection of delectable recipes. Beautifully illustrated throughout with full-color photographs and featuring 100 tantalizing recipes, Morton's the Cookbook brings Morton's exceptional fare to your home every day.